A Honey of a Bee! 1 Do you like to eat honey? Do you like to eat apples? How about watermelon? If you do, you should thank honeybees. Honeybees make honey. Honey is sweet. Many people like to eat honey on bread. Bees also help plants and trees. Bees help new plants to grow. Bees help plants make fruit. 2 A bee lands on a flower. It wants pollen from the flower. It wants nectar, too. Bees make honey as food for themselves and for baby bees. Nectar is a sweet liquid made by flowers. 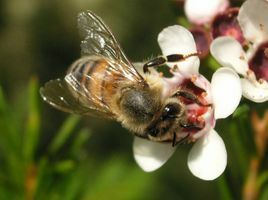 Bees use the nectar to make honey. Feedback on A Honey of a Bee!